Britain's David Haye put on a magnificent performance to claim the WBA heavyweight crown from Russian Nikolay Valuev in Nuremberg. Haye, 29, won by majority decision, winning the fight on two judges' scorecards, with the other judge scoring it even. The Londoner, giving away seven stone to his 7ft opponent, fought the perfect fight, staying on the move and making the lumbering Valuev look every one of his 36 years with his speed. With his win, the Londoner becomes the first Briton to hold a world heavyweight crown since Lennox Lewis retired in 2003. In addition, Haye is also only the second former cruiserweight champion to win a portion of the heavyweight crown, after four-time champion Evander Holyfield. "It means everything to me," said Haye. "From when I was a baby, I said I would be the heavyweight world champion. "It's a dream come true. I've fought the biggest heavyweight champion and caught him with big shots. "I made him look like an amateur. People doubted my skills, but I did enough to win. "Here I am, heavyweight champion of the world and I'm loving it. I'm going to clean up the division." Approximately 10,000 fans were in attendance at the Nuremberg Arena, including a sizable and vociferous British contingent, to see David do what many thought was impossible and slay Goliath. Even more remarkable, Haye managed to do it with a suspected broken right hand, which trainer Adam Booth said gave way in the third round. "His head is solid, the hardest thing I've ever hit," said Haye. "It's like hitting a solid brick wall. "I'm pretty sure my hand is broken, but it's a small price to pay for being the heavyweight champion of the world." The first round was largely a fact-finding mission for Haye, circling anti-clockwise away from Valuev's big right and scoring with the occasional flurry to the head and jab to the body. 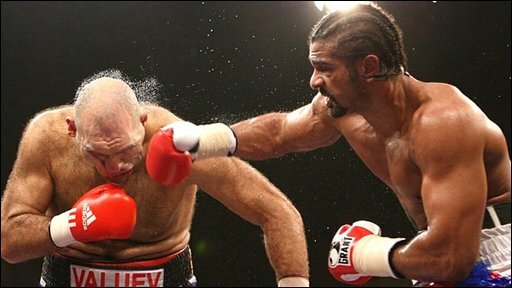 An immaculate-looking Haye visibly grew in confidence in the second stanza, landing with two sharp left hooks and a stinging left-right combination that forced Valuev to cover up. Valuev landed with his first meaningful blow at the end of the round, a ramrod jab, but it was more of the same in the third, with Haye having little problem slipping Valuev's left hand and scoring with flashing lefts of his own. Haye had made Valuev look decidedly sluggish and one-dimensional in the first quarter of the contest. Even though the Russian showed more urgency in the fourth, the Englishman was able to extricate himself from any potential trouble. With both hands now slung by his waist, once again he had the better of the action, landing with a couple of left-right-left combinations and skimming Valuev's jaw with a huge right hand on the bell. Haye found the mark with a left-right-right combination in round five, and it was becoming abundantly clear as the fight wore on that unless he was to tire down the stretch, the title could be his. Valuev managed to pin Haye in a corner and unload with two clubbing blows to the body at the start of round six, but Haye hit back with a hurtful upper-cut and a big over-the-top right. There were signs that Haye was beginning to tire in the seventh, but he came storming back in the eighth, stiffening Valuev up with a rigid jab before landing with a rasping right to the body. The ninth was close until Haye unloaded with perhaps the best combination of the night, a left jab followed closely by a right straight down the pipe and Haye landed with two more right-hand bombs in the 10th as Valuev began to look desperate. With Haye's staying power questioned in the past, the last two rounds, if it got that far, were always going to be tense, but Haye continued to move in round 11, leaving Valuev needing a knockout to win it in the final stanza. In the final round, Haye almost achieved the impossible, very nearly flooring Valuev with yet another vicious left-right combination with a minute to go. Valuev regained his balance, but Haye continued to pepper the Russian until the final bell sounded. "From my point of view, the main thing which went wrong was the pace," said Valuev. "It was like a marathon for me. It was like a track event. I wasn't ready to run that much. "The judges made their decision and I think the last round made the difference, especially the end of it." Haye, who was awarded the fight 116-112, 116-112, 114-114, is only the third Briton to win a world heavyweight title since Bob Fitzsimmons lost his crown to James J Jeffries in 1899. His victory also injects some much-needed vim into a previously moribund heavyweight division. With 23 wins (21 KOs) from 24 fights, Haye now says he intends to clean up the heavyweight division. That would mean defeating WBC champion Vitali Klitschko and his brother IBF and WBO holder Wladimir Klitschko. But his first defence of the WBA belt will likely come against American John Ruiz, who earlier on Saturday beat German Adnan Serin in the seventh round by a technical knockout. Haye said he envisages few problems against the former WBA champion. "I don't think he is the most entertaining. He has won the world title before and you don't do that by being a bad fighter," he added. "I will be way too fast, I will knock him out."